A shape that originated long ago, the cushion is a combination of the Old Mine Cut and the modern oval. Today's precision engineering, which facilitates unique faceting, has modernized the classic cushion cut to maximize its intensity and brilliance. Cushions come in square to rectangular shapes and are sometimes referred to as "pillow cuts." Mostoften, cushion cuts have rounded sides and rounded corners. As one might guess, the emerald cut is so named because of its similarities to the shape in which most green emeralds are cut. Anelongated square or rectangular cut, the emerald shape is eight-sided with step-cut sides and notched corners. There are usually three concentric rows of facets on the crown, another three around the culet. Similar in presentation to the emerald cut, it is a square, rather than rectangular, cut-corner shape. The step cuts along the pavilion of the gem meet at a point at the culet, rather than a long cue line as in the emerald cut. A classic side stone, the baguette is the natural pre-cursor to the emerald cut. A four-sided, rectangular step cut stone with pointed corners. Tapered baguettes are also available, and make lovely accents on either side of an emerald or cushion cut diamond for an antique look. The shape of a Valentine- the most romantic shape of all- a heart is actually a version of the pear with a notch cut into the top. It is perfect for engagement rings and pendants. An elongated shape with pointed ends. Legend has it the shape was inspired by the smile of the Marquise de Pompadour and the cut, which was created by King Louis XIV, was named for her. An elongated round, the oval is an even, symmetrical design that is flattering to a woman with small hands or short fingers because its shape gives the illusion of length. An oval can vary from short to long in shape. This is a hybrid cut that combines the oval with the marquise, resulting in a teardrop shape. 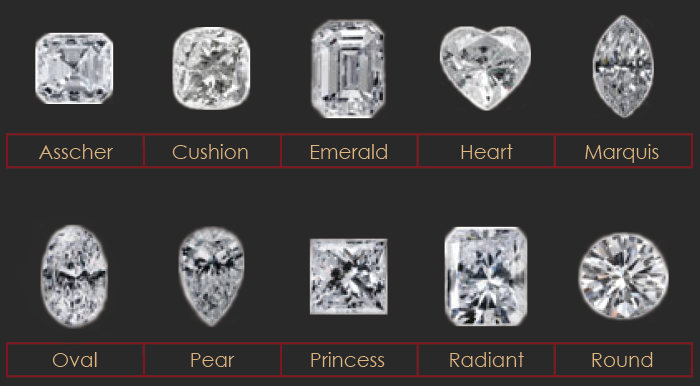 While a pear shape is beautiful in a ring, it is equally dazzling in earrings or a pendant. This is a four-sided brilliant cut that is square or rectangular with numerous facets. It has become increasingly popular in engagement and fashion rings set as side diamonds. This can be a traditional triangular shape with pointed edges or a more rounded version with 25 facets on the crown, 19 facets on the pavilion and a polished girdle. Generally used as side diamonds. A square or rectangular cut that combines the shape of the emerald cut with the faceting pattern of the brilliant. Requires more weight to be directed toward the stone's depth. This shape represents more than 75% of all of the diamonds sold today. The classic round brilliant shape uses a precise formula to achieve the most brilliance and has 58 facets from top to bottom.